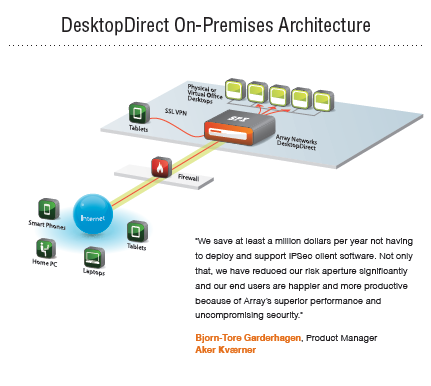 Array’s DesktopDirect remote desktop solutions are transforming the way businesses think about remote and mobile access by rapidly and cost-effectively enabling full application availability to any device anywhere without the risk of data leakage. Mobile devices and mobile working are driving major changes in the enterprise. More users must be able to work from anywhere and more users want to use tablets and smart phones as business productivity tools. The challenge for businesses lies in finding an approach that provides full application availability from remote devices, tablets and smart phones, while making sure that sensitive data never leaves the corporate network. physical and virtual office desktops to any user on any device anywhere. Moreover, DesktopDirect is fully secure and delivers unmatched ROI as compared to alternative remote and mobile access solutions.